I saw this on Pinterest the other day, and knew that I had to make. As in, that night. Fortunately for me, I had all the ingredients on hand. Turns out? This was one of the best pasta dishes I've ever made. Now, truth be told, I don't cook pasta all that often. I come up with the occasional dish, but usually I try to stick to proteins with dinner dishes. I adapted this a bit, based on our taste preferences. I didn't have the highest expectations, but it was so unbelievably tasty and packed with flavor. Not to mention, it really didn't take long to make. As in, less than 30 minutes. Top this with your protein of choice (salmon, do it!!) and you have a nicely balanced meal. I'm thinking next time I'll try to sneak in some veggies. Maybe asparagus or cauliflower? Let me know if you have any ideas! *Boil water in a large pot and cook pasta until al dente. *In the mean time, saute onions in olive oil 7 minutes or until tender, adding garlic and crushed red pepper in the last minute or so. Pour in half & half, goat cheese, salt & pepper. Stir to melt goat cheese into sauce and keep warm over low heat. 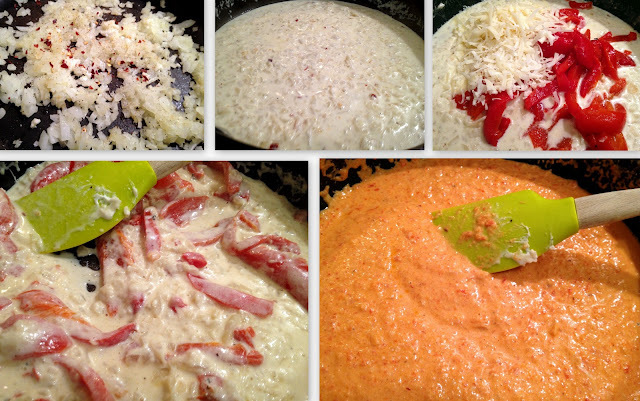 *Chop peppers into large pieces and place into sauce along with parmesan and fontina cheese. Stir to melt cheese and remove from heat. *Use a hand blender to puree sauce in the pan (option 1); or pour sauce into a blender or food processor to puree, then return to pan (option 2). Taste and adjust seasonings. Combine with pasta and serve immediately. Note: I served this with some broiled salmon on top, and it totally took it to another level. Delicious! Plus, the added protein makes the pasta more sustaining. mixing it all up | blended and ready! Dinner...pictures don't do the taste justice. Made this tonight and it was awesome!! i added shrimp to it and it made it perfect! Thanks for the great recipe, my 3 year old loved it too!